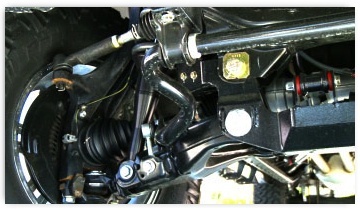 Today's Mesquite car care article focuses on your suspension system. After many years and tens of thousands of miles, your minivan suspension system components do wear out, but how long that takes depends a lot on how you drive. As you can imagine, if most of your driving is on smooth Mesquite highways, your shock absorbers will last a lot longer than if you do most of your driving on bumpy roads or hauling heavy loads. In addition to just wearing out, Compton Automotive customers need to know that suspension components can be damaged in an accident or by a hard impact – like a pothole, hitting a curb or a rock in the road. Because the life span of shocks can vary so widely, your minivan manufacturer and Compton Automotive recommend periodic inspections. During an inspection, your Mesquite service technician will check for worn, broken or missing parts. Signs that shocks or struts are wearing out: The tires may have a cupped wear pattern. This is from the shocks bouncing unevenly as you drive around Mesquite. You may notice a floaty or drifting sensation when cornering. If the front of your minivan dives excessively when stopping, or rocks back and forth after you stopped, your shocks may be worn out. And if they are leaking fluid, it’s definitely time to replace them. If you are experiencing any of these symptoms, come into Compton Automotive for a suspension inspection. Same if you’ve been in an accident that involved one of your wheels. Worn or broken shocks can cause premature wear or failure on other minivan suspension parts such as ball joints and other steering components as well. If your suspension actually fails, it could lead to a serious accident, so let us take care of your suspension components at Compton Automotive. When you replace your shocks, it’s usually a good idea to replace all four at the same time. That’ll give you more even handling. Talk with your service advisor at Compton Automotive because you don’t want a big difference between the performance of your shocks from wheel to wheel, and replacing all may be the safest bet. Give us a call if you need to do some customer detective work in Dallas TX 75218! Suspension systems should continue to operate effectively for many years and tens of thousands of miles, holding your tires’ foot print on the road. Eventually components do wear out, but how long that takes depends a lot on how you drive. As you can imagine, if most of your driving is on smooth TX highways, your minivan shock absorbers will last a lot longer than if you do most of your driving on bumpy Dallas roads or hauling heavy loads. In addition to just wearing out, upgraded shock suspension components can be damaged in an accident or by a hard impact – like a pothole, hitting a curb or a rock in the road. Because the life span of shocks can vary so widely, your vehicle manufacturer recommends periodic inspections. During a car inspection at Compton Automotive, your Dallas service technician will check for worn, broken or missing suspension parts. If the inspection reveals any problems, take care of this important safety and handling work. When you replace your shocks, it’s usually a good idea to replace all four at the same time. That’ll give you even handling at all four corners of the vehicle. If you have special road handling needs like improved cornering or towing or hauling requirements in Dallas, your Compton Automotive advisor can recommend an upgraded shock or strut to get you what you want. At Compton Automotive, we have been providing quality auto repair in Dallas for 7 years. Ask manager Donnie Compton about power steering service and cooling system service. Give us a call.